The window for Canada and the U.S. to land a NAFTA breakthrough this week is getting smaller, as officials sit down in Washington, D.C., today for what are expected to be the final high-level meetings this week. 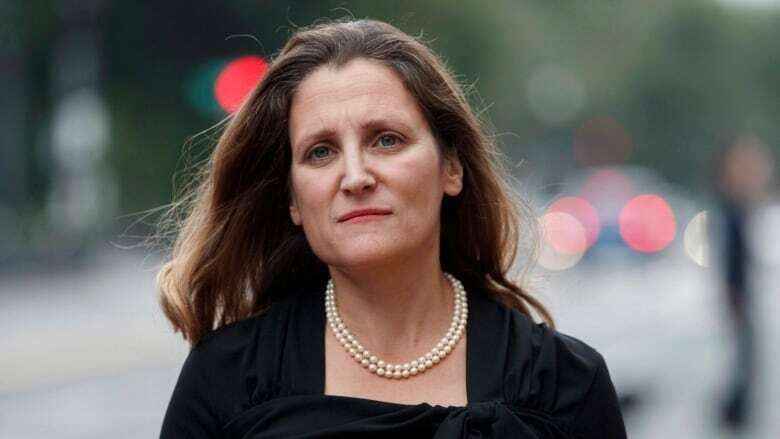 Having dealt with a number of "tough issues" this week in Washington, Foreign Affairs Minister Chrystia Freeland is leaving her NAFTA negotiators to work around the clock in the U.S. capital while she flies home to host an international meeting of female foreign ministers in Montreal. "We discussed some tough issues today," Freeland said Thursday afternoon. "The atmosphere continues to be constructive and we continue to work hard towards a deal, which has always been Canada's objective." Freeland said that since this most recent round of negotiations began, negotiators have been working around the clock to find compromises on the remaining issues. Despite the pressure to meet a U.S.-imposed deadline —​ the American side wants a deal within days in order to meet U.S. trade law timelines and get the final document signed by Mexico's outgoing government —​ Freeland maintained that her focus had not changed. "Canada has, from the very beginning, been guided by a single metric and we continue to be guided by that single metric today, and that metric is getting a deal that is good for Canada and good for Canadians. That is our target," she said. This week's talks are being described by several sources with direct knowledge of the situation as "tense," "frank" and "slow," especially on the significant issues. And new challenges are emerging as the Canadians look for protection from the threat of American tariffs. One senior source said Canada is seeking assurances from U.S. trade officials that it will be recognized as a special trading partner, as a shield against what the Canadians say are punitive tariffs. The unusual move comes after U.S. President Donald Trump imposed 25 per cent tariffs on steel and 10 per cent on aluminum through a rarely used national security provision. The larger concern is Trump's threat to slap similar tariffs on imported autos and auto parts. If that were to happen, economists say, the North American economy would grind to a near halt and thousands of jobs would be killed. The source said the Canadians recognize the Americans will never agree to restrict their ability to protect their national security interests. But Canada is still seeking a carve-out of protections against the threat of American tariffs ​and recognition that Canada is not seen as a threat. Canada has not been able to get any assurances, with the source suggesting Trump enjoys relying on tariffs, treating the economic measure like a "toy." There also has been little movement behind the scenes on Chapter 19. Canada wants to keep the independent dispute resolution system in the North American Free Trade Agreement, while the Americans have formally requested it be eliminated. The source said it has been made clear that U.S. Trade Representative Robert Lighthizer "personally hates" Chapter 19, as it has long been a source of frustration for the ambassador. Protections for Canada's dairy industry are also still a point of contention. Canadian negotiators have proposed giving U.S. farmers more access to the Canadian market, but suggestions so far have not satisfied American negotiators. The Americans, who reached an agreement in principle with Mexico last month, are pushing to get a deal with Canada before Oct. 1 — a deadline set in hopes of hitting the congressional timeline required for a renegotiated NAFTA to be signed before Mexico's presidency changes hands on Dec. 1. Sources have repeatedly told CBC News the Canadians are willing to work on that timeline, but will not be rushed into a fast finish for the sake of reaching a self-imposed deadline. "My biggest fear in all of this is that we don't find a soft spot that we can all live with and workers in all three countries end up paying the price," said union leader Jerry Dias, also in Washington to monitor the talks. His union, Unifor, is Canada's largest private sector union and represents auto workers. Dias said that a great deal of attention in the talks has been focused on Canada's de minimis level — the price level at which consumers have to pay duties and taxes on imported goods, whether through bringing items back on a trip or ordering them online and having them delivered by mail or courier. In the U.S., that level is set at $800 US. Mexico already has agreed to double its threshold from $50 to $100 US. Canada's level stands at $20. Despite the ongoing debate about this issue and others, Dias said that progress has been made on behalf of workers. "Trade deals have always been about free flow of capital. It's always been about money, it's never been about people.," said Dias. "This round of negotiations, we've actually had decent discussions about people, about jobs, about standard of living, about wages in Mexico. So there's been a lot of great work done and my only concern is that somehow the great work gets flushed because of great stubbornness and stupidity."